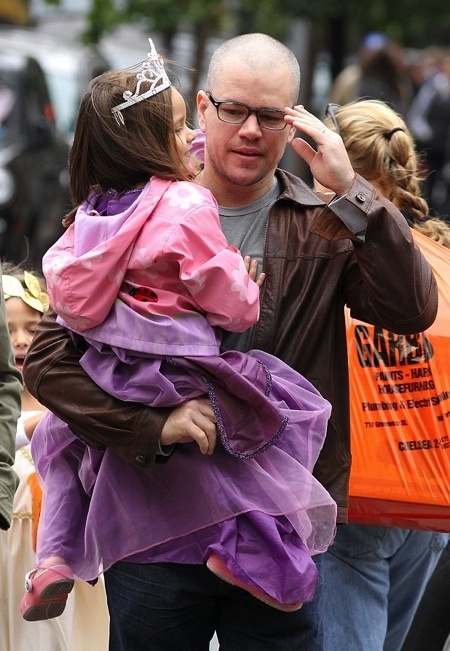 Home » Matt Damon Trick or Treats With His Girls! Halloween came early for the Damon family! 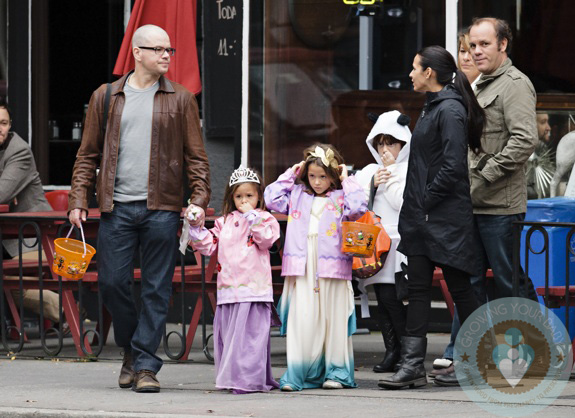 Actor Matt Damon and his wife Luciana were spotted on Sunday out trick-or-treating with their daughters Isabella and Gia in the West Village, New York City. The girls stayed warm with their jackets over their princess costumes as they made their way through the city. Matt was almost unrecognizable with his bald head, which has been shaved for his role in Elysium. He carried Gia’s treat bucket and then carried her when she got tired. He went on to gush about Luciana and detailed how busy their family life is. The couple’s oldest and youngest daughters we not along for the festivities. Maybe we’ll get to see them dressed up on Wednesday night!